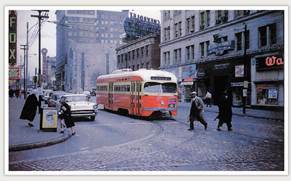 Relive street travel of yesteryear as historian Mark Goldfeder shares rare film footage of St. Louis along the 485 miles of streetcar track that carried people until May of 1966. Prior to the program, enjoy a lunch of vegetable lasagna, Italian salad, Texas toast, a fruit cup, and brownies for dessert. Coffee, water, and iced tea will also be available. A gluten-free option will include GF pasta, roll, and dessert. To make a reservation call Lisa at 314-432-8050 ext. 204 with your attendees’ names, phone numbers, and lunch preferences.